Poster signs are standard for promotional displays for trade shows and conferences, but also work nicely for temporary stalls at a weekend market. These fade-resistant signs are popular for use in outdoor settings and in situations where they need to be handled frequently. Being water-resistant makes them even more durable in such situations. Because they are on such a sturdy material, they are often used for a higher-quality poster printing solution as well. They are a popular art reproduction medium for your own art or as an easy way to add color to your business or office walls. You can even use them to present data or ideas as a way to boost the look of a presentation. 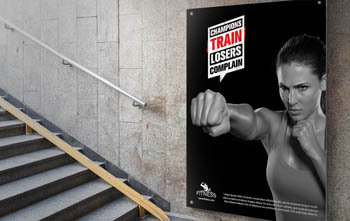 All NextDayFlyers poster signs are a simple, high-quality solution for a wide range of large print applications. They are ready to hang and come in 5 standard sizes. They can be printed on white PVC board or on 20 mil. styrene material. You can expect bright, vivid colors whichever material you choose. Poster Signs is rated 5.0 out of 5 by 2. Rated 5 out of 5 by Ltpraisehim from Thank You The full color poster turned out nicer than I had expected and arrived as planned. Highly recommend using Next Day Flyers. Rated 5 out of 5 by K L Music from ordering was easy, it was on time and great. easy to order, on time, looks great. will be repeat customers for sure.